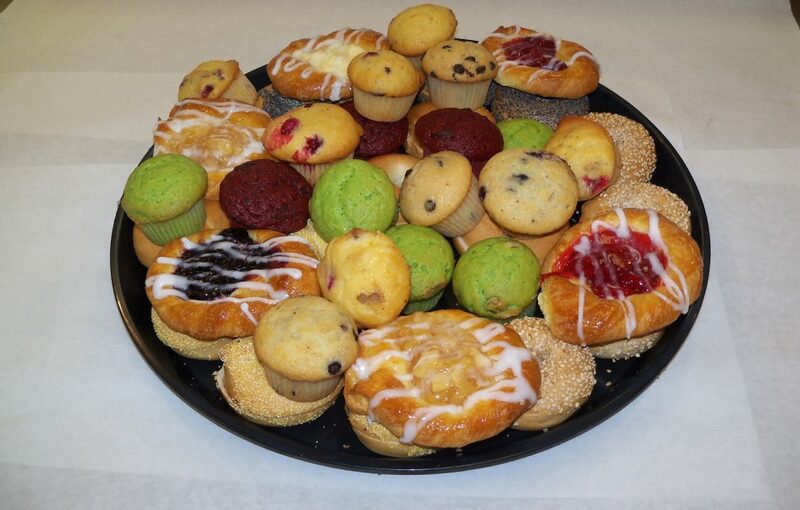 An assortment of mini danishes, mini bagels, and mini muffins arranged on a platter. This platter includes our own cream cheese. Make your breakfast event at work a tasty occasion with a supreme breakfast platter from Between Rounds Bakery Sandwich Cafe. We know how hard it can be to get employees and clients motivated in the morning which is why we developed the Between Rounds Breakfast Platter that will jump start any corporate meeting, conference or sales review. This delicious breakfast platter includes a fine assortment of mini Danishes, mini bagels and mini muffins arranged on a platter that includes a variety of cream cheese flavors. A large breakfast platter can serve 14-16 and a small platter serves 8-10. You can also add to your breakfast servings with our fresh fruit platters, cookie platter and dessert platters that includes a delicious assortment of fresh cookies and fudge brownies. Delivery is available, corporate accounts are available and all major credit cards are accepted. We can also host meetings at our South Windsor location that features a private meeting room that can accommodate up to 20 people. Take the stress out of your event planning by contacting Between Rounds today.